Note: This article on physical therapy memberships is the third of a series of blog articles that address issues raised by physical therapists on various social media network groups where we are also members. 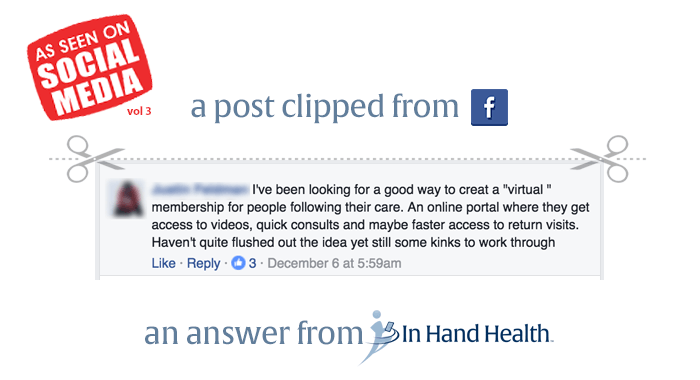 This article covers how you might manage virtual (online) physical therapy memberships at your practice. But before the “how”, it might be a good idea to talk about the “why”. For starters, extending a wellness or other post-care plan via an online portal or telehealth secures long-term patient relationships. Your practice also receives a sustainable boost in income from patients who sign up for your virtual post-care or wellness programs. The contact you keep with these patients might also lead to appointments for any future musculoskeletal issues. Without your post-care connection through your virtual physical therapy memberships, these same patients might seek treatment elsewhere or not at all for their new aches and pains. Offering a virtual connection to your physical therapy practice during care might also be worth considering. Presently, many PT practices see a patient once a week. He or she heads home with printed exercises. The PT then gauges the patient’s progress when they return in seven days. But what if physical therapy memberships were in place during treatment and before the patient entered a post-care or wellness period? HIPAA-compliant messaging. Video-based home exercise programs. Real-time progress and feedback charts. All of the above provided as a complementary or paid service help to engage the patient and add value to the time and money spent with your practice. And when it comes time for post-care, the established connection is already validated by the patient and worth the paid value (subscription price) your practice puts on it. Virtual physical therapy memberships are a brand new idea for some PTs. However, the general concept is increasingly familiar with patients in other areas of healthcare. Plans vary at these concierge practices from wide-open walk-in access to their physicians to a more limited but still convenient virtual access. The common factor is a subscription/membership model: Pay by the month or year. The value in a subscription approach is quickly recognizable according to Matt Jacobson. He is CEO of SignatureMD, a company that helps general practices across the country transition to a concierge care model. Bottom line: The timing is right for physical therapy memberships. Practices need to investigate their options and present them with confidence to their patients. Who Benefits From a Physical Therapy Membership? So you may be thinking, which one of my patients would benefit from a physical therapy membership to my practice? Should I simply provide it as a value-added service? How many patients would pay for such a service during an episode of care vs during a wellness period? The reality is it might not be a fit for everyone from a technical or financial standpoint. For some situations, however, a virtual membership might keep patients engaged during a plan of care and beyond. Do you have patients in rural areas? Telehealth-based physical therapy memberships could replace an office visit on occasion. With the savings in gas money and travel time, some patients will realize the value in a subscription right away. Online physical therapy memberships also fit patients who work out of town several days a week. Imagine being connected to those heavy business travelers virtually. You could offer advice or deliver a helpful exercise on the spot rather than waiting weeks to be able to talk to them at your clinic. Are you adding value to that patient relationship through physical therapy memberships in those situations? Certainly so. A telehealth connection between you and the patient whose condition prevents regular visits to your clinic can help keep them engaged in their rehabilitation. You are also providing them a sense of security. The system enables them to reach you through the convenience of their mobile device. How many cancellations do you receive on snowy or icy days? Any revenue from your physical therapy memberships on those wintry days would probably make you feel better about your suddenly open schedule. And even if you are just providing the service for free, your patients would still be able to supply feedback and receive instructions. And then there are some patients who want to remain connected to your clinic but don’t necessarily need regular appointments. They are perfect for your virtual wellness/post-care programs and physical therapy memberships. So it seems there are plenty of benefits to exploring virtual/telehealth connections with patients. Altogether, they differentiate your clinic and deliver added value. The technology is definitely there (see In Hand Health) to help your practice meet its goals in this area. The key to success is understanding patient attitudes toward healthcare in general have changed drastically in recent years. For the most part, they are paying more and expect more service and more value than before for their money. They also are used to on-demand access to information at their fingertips. Mobile apps provide instant information on everything from banking to weather and, of course, their healthcare. Providers, especially physical therapists, must also value their services when offering them through new technologies. And when possible, they should not be afraid to charge for them. The leap may take some faith but the payoffs look promising as the healthcare landscape continues to rapidly evolve. Previous Previous post: Physical Therapy Telehealth Solutions Will Move PT Forward. If You Try Them, That Is.